“Love ties them together. Death can’t tear them apart. It doesn’t help that Aura’s new friend Zachary is so understanding–and so very alive. His support means more to Aura than she cares to admit. This book took me completely by surprise and far exceeded my expectations. As did Aura’s character, who’s unlike most YA characters I read about so far. Her actions and reactions are and read real and mature. Which shouldn’t be a surprise since Miss Ready isn’t a teenager, but you know how most YA characters sound like they’ve been penned in by a hormonal, raging 16-year-old? Aura isn’t like that. She’s not one to love the extremes. She wallows and cries, but doesn’t completely fall apart. She rebels and gets mad, but doesn’t turn hysterical. Shade is definitely a tear-jerker novel but in that hauntingly beautiful, greatly written way, yanno? I liked all of the characters, including Logan who wasn’t particularly easy to like in his whiny and/or reckless states. Most of all, I loved Zach and the way he talked. Not to say I have any idea on what constitutes Scottish slang, but it sounded good enough to me. For those of you afraid of the love triangle angle – like I was after reading the description – rest assured, it’s not what you’d expect. The way Smith-Ready makes her characters deal with the situation at hand is novel to any other love triangle romances and it didn’t make me cringe and tear my hair out in frustration, screaming “just pick one!”. I don’t even know if it should be called a love triangle since she can’t ever again have a relationship and all that encompasses with Logan – and they both know it. It’s only a triangle from Aura’s POV and based on her feelings and it’s..natural. Again, real. Also, the mystery behind the Shift and how Aura and Zach fit in, while sort of vague – we don’t get much of an explanation in this first book, is very interesting and makes you crave for more information. I liked Ready’s writing: it’s clean and easy to follow and her comparisons are damn funny; she unfolds the plot at a smooth pace and leaves you wanting more. 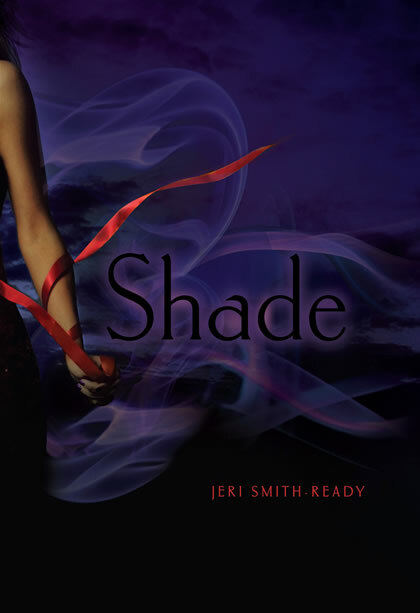 All in all, don’t waste any more time and start reading Shade. NOW!